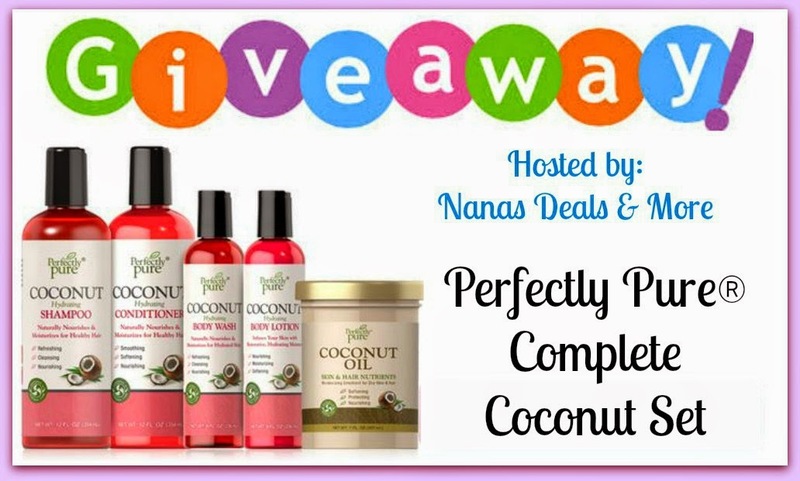 The ABCD Diaries: Perfectly Pure Complete Coconut Set #Giveaway! You can read Nana's full review HERE. This blog , ABCD Diaries, did not receive any free product for this posting . Promotion Starts May 01. 2014 12:00am/est and Ends May 06,2014 at 12:00 am/est. This giveaway is open to US residents only age 18+ The winner will be selected at random via Random.org. and contacted via email. Only one entrant per mailing address, per giveaway.The winner will have 48 hours to claim prize. If prize is not claimed, prize will be forfeited. Facebook, Twitter, G+, Pinterest, or Instagram is in no way associated with the giveaway and released from any and all liability. Sponsor is responsible for mailing prize to winner, not ABCD Diaries or Nanas Deals and More. I would love to win this set because of the great things coconut oil brings out in your hair and in your skin. I've heard and read so many great things about coconut oil; it's great for overall health. I would love to try it to improve the condition of my hair and skin. I want to win since I love coconut scent! Lovely set!My hair could use some pampering! I would love to win this because coconut is so good for the hair and skin, I need a lot of help in those areas as of late. I would love to win because I like to find and try new beauty products. I have heard of this product before, but just have never had the chance to try any of them yet. Heard that they are really nice to have. I would be grateful to have this prize. I have not tried their products before and would love to see how they work. I want to win this because it looks like a great set!